I grew up spin fishing on family vacations. It was not until college that I was introduced to fly fishing for my senior thesis. Insert work, post college crazy, and a ton of traveling, I have now been fishing seriously for the past two years. 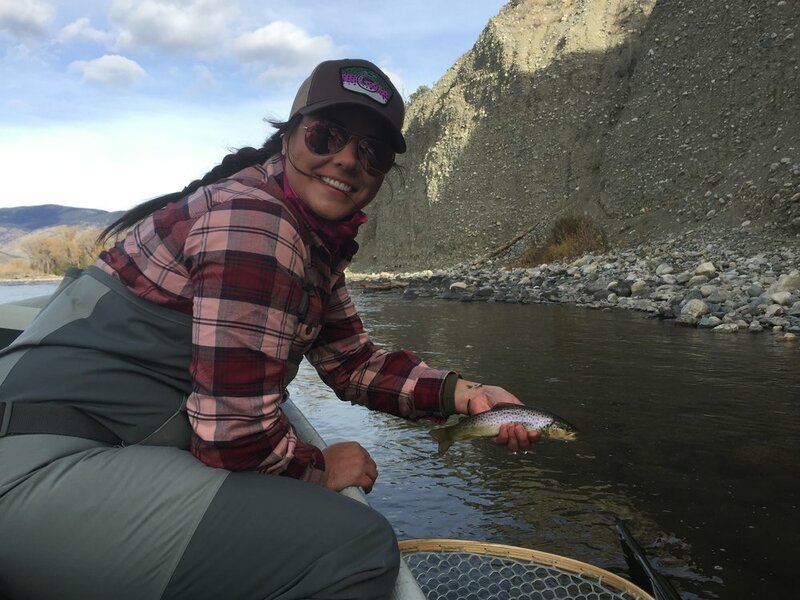 When did you attend the Montana Fishing Guide School? I attended Guide School in October, 2016. For the last 6 years I've been balancing work, travel, and a longing desire to be outdoors, traveling more, and experiencing life, not just wasting it away in a cubical. Two years ago, my eyes were opened to the value of time. I was in a career I felt trapped in, in a town that was smothering, and overwhelmed with what if emotions. It was then that I decided to pursue a career in the outdoor industry full time. I called it my "going for broke dream". I planned, saved, and planned some more. And finally in April 2016 I left corporate America full time and have been pursuing this crazy dream ever since. As a female in the outdoor industry I did a lot of research on how to best make an "entrance", and being educated is one of the best ways to do that. I found the GRG guide school program through a good friend and signed up! You will get out of this career what you put into it. Guiding is all about time. If you put in the time to learn the water, the hatches, the seasons, understand the business, and can selflessly set aside your own desire to fish to help other get "hooked" on the sport this industry is for you. Late in the week, the "How to Conduct a Walk Wade Trip" day came up. We were standing in the parking lot of the Buffalo Jump, Pat was reading off they day's agenda... and all myself, Mike and Craig could think about was getting back into the warm truck, continuing the laughs and getting on the water. After about 15 minutes on the Gallatin, the boys left me alone to hike upstream. I was tucked behind a huge boulder in Greek Creek, I'd lost site of the guys, and was enjoying some solitude when the indicator dipped under the surface. I set the hook, and off it ran! One the end of the line a beautiful Gallatin fish... or now as I call it a Madison fish. A whopper at close to 17 inches long, this rainbow changed the course of the trip! I do! I see Mike & Don almost weekly in town or on the water. I keep in touch with Laura & Matt quite frequently. We were a pretty close group and check in on one another. Are you looking to break into the industry? Begin to build a network of like minded people? Or simply want to improve your skills as an angler. Guide school is the right choice for you. For me, it allowed me to feel confident about relocating to Montana to pursue the outdoor industry full time. I am not working for Pat at GRG in the fly shop, learning, fishing, and waiting for my time to guide! Looking back on the week, it seems like a blur. Early mornings, coffee filled talks, hours on the water, and nights spent building the foundation of friendships, the week was a great launching pad! 8 am: Arrival at Gallatin River Guides Fly Shop in Big Sky. Introductions and overview. 10:00 to 1:00. Entomology for Catching Trout. Lunch provided. Gallatin River Guides. 1:00: Fishing. Managing a walk-wade trip. Gallatin River. 5:00: Fly Tying. Gallatin River Guides. 7:30 am: Previous day recap; The guide’s kit bag: items to have and to not have. 6:00 pm: First-Aid and CPR Training. 7:30 am: Previous day recap; Marketing Yourself. Finding Jobs and Getting In the Biz. 7:30 am: Previous day recap; Being the Rookie Guide. 7:30 am: Previous day recap; Building rapport with clients and maintaining relationships. 7:30 am: Previous day recap. Guide Profit and Loss. Keep more of what you make. Early evening: Course closure. Depart by 5 PM.